As an innovative version of Reuleaux Series, the Wismec Reuleaux RX200S TC 200W Box Mod comes with a variable temperature control system and unique cool exterior. 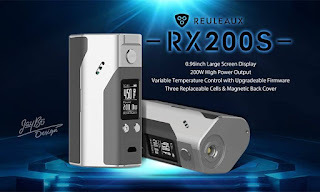 (Pre-purchase 100% authentic Reuleaux RX200S at: http://www.wismec.org/reuleaux-rx200s.html). It equipped with a 0.96inch OLED screen, so you can see all the parameters on the device clearly.